Miscasting the results achieved during the presidency of George W. Bush is one of the more important elements of the national establishment press's non-stop attempt to defend Barack Obama's utterly indefensible fiscal record. David Lauter's contribution to that effort appeared at the "Politics Now" Blog at what remains of the Los Angeles Times on October 16. He claimed to be conveying "four facts about the national debt you may not know." Readers could have and should have stopped at Item One. Combined with the Bush #43 historical revisionism contained within that assertion, Lauter concocted the Certs Breath Mint of falsehoods: "Two Lies in One." This isn't about a newbie journalist just out of college. Lauter is an assistant managing editor who is old enough to remember those Certs commercials. In his position, he "oversees the Times' coverage of news across California, heading the news organization's largest editing and reporting staff." 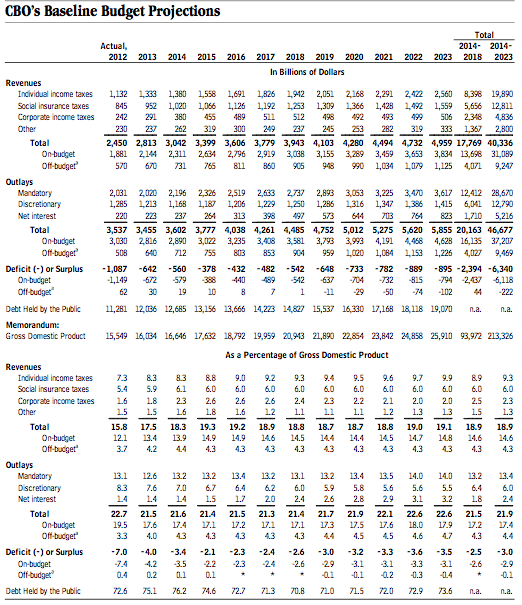 Lauter's opening pseudo-fact is that "the U.S. debt burden is starting to decline." Not "will decline in the future" (which itself is almost definitely not the case, as will be seen later), but "is starting to decline." No such decline is underway, even under Lauter's permissive definition of "burden," which is "debt held by the public as a percentage of gross domestic product (GDP)." By that measure, the debt grew rapidly during most of President George W. Bush’s tenure and President Obama’s first term as the government borrowed money to fight two wars and the deepest recession in more than half a century. But the rapid growth ended more than a year ago. 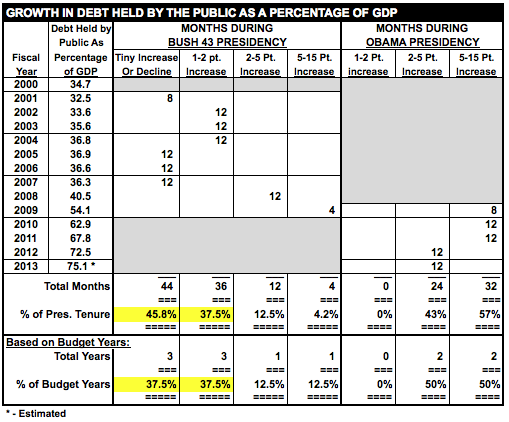 Using the results of full budget years and assigning responsibility by presence in office, the table shows that there were decreases or negligible increases in public debt to GDP during 44 of Bush's 96 months. There were increases of between one point and two points, which by Lauter's aforementioned standards are clearly not significant, during another 36. Only 17 percent of Bush's two terms contained full or partial fiscal years with public debt-to-GDP growth of two points or more, and only his final four months saw the kind of rapid annualized growth (5 points or more) seen during over half (57 percent) of Barack Obama's presidency to date.